FingerLakes.org This is the Finger Lakes tourism alliance site. A remarkable resource and searchable information resource. Far removed from the bustling streets of New York City rests one of New York State's most treasured destinations: the Finger Lakes Region. With a rich history and world-renowned for its production of award-winning wines, this natural wonderland offers one of the most visually stunning and peaceful getaways in the United States. Although the beauty and charm of the Finger Lakes Region is widespread, nowhere are these attributes more prevalent than in the shimmering lakes themselves. The long, slender bodies of water offer an invigorating splash of fun and host a full range of year-round activities. 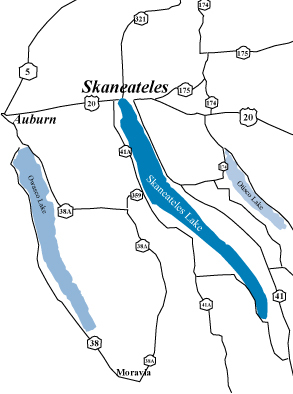 Ontario County, located about 75 miles east of Niagara Falls in the heart of the region, is home to five of the eleven Finger Lakes. 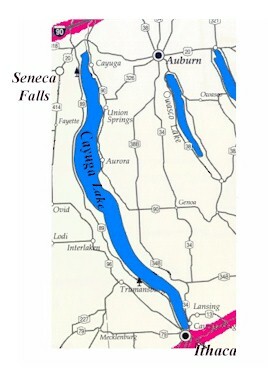 Among them are two of the largest - Seneca and Canandaigua. 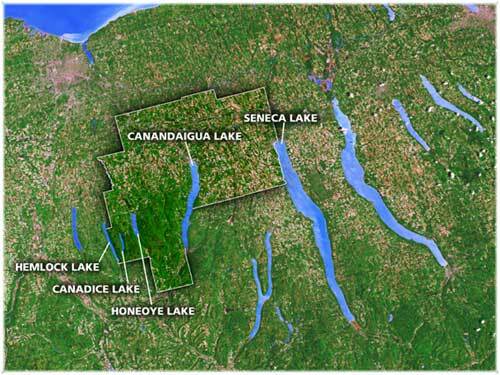 Today, the communities that make up Ontario County are known collectively as "Lake Country." In addition to the numerous landmarks, one of the most preserved assets in the Finger Lakes region continues to be its living splendor. Local farmers are blessed with a land as rich as its history. Innovative research facilities and fertile growing conditions help produce an abundance of native agricultural products, which contribute to the region's hands-on tourism experience. Whatever you're looking for in a destination, you'll find it in the Finger Lakes Region. Activities, spectacular scenery, history, culture and entertainment - there are so many reasons to visit. Ontario County's Lake Country has the "fun of it all." For Cycling Enthusiasts! The Finger Lakes Cycling Club (FLCC) is an organization for bicycling enthusiasts in the vicinity of Ithaca, New York.This website is one way for members to find out about events, get route maps, publicize club events, and otherwise communicate about cycling in the. You're invited to subscribe to their email list for info. For Sports Car lovers, The Finger lakes Sports Car Club The Finger Lakes Region of the Sports Car Club of America (SCCA) comprises the area around Rochester, New York. We are dedicated to providing a safe and fun venue for participatory motorsports in Upstate New York. SKYDIVERS! FInger Lakes Skydivers Club is located at the Ovid Airport in the Finger Lakes Region of upstate New York. With a friendly atmosphere and beautiful scenery this is the central New York Skydiving Center you should visit. Let us take you on your first tandem skydive. Geologists - Finger Lakes Geology The Finger Lakes region of New York State is one of the most geologically spectacular areas of the eastern United States. Few other places east of the Rockies expose so much sedimentary rock in such a visually striking manner. It is an area not only of extraordinary beauty, but also of extraordinary geological importance. Here we can not only marvel at geology, but also learn a great deal about it. Flying & Areo Sports Fingerlakes Aerosports Park - Discovery flights, training, Fly- Ins, photography, seminars, club membership. Finger lakes Trailrunners - Snowmobile club. GOLFERS Fingerlakes Golf Trail We Invite You to explore the world famous Finger Lakes Region and enjoy the most Challenging golf courses available to the public. The Finger Lakes Golf Trail is comprised of the 4 Finest golf facilities in the Rochester & Finger Lakes Region.